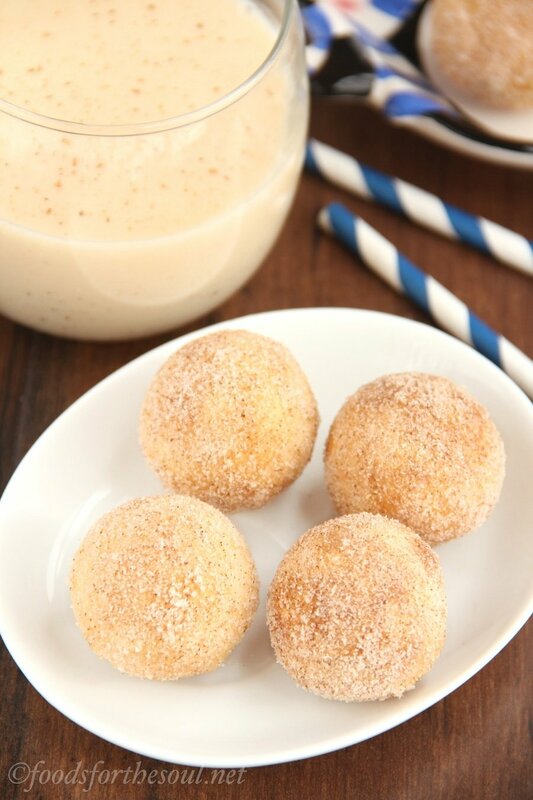 Chewy snickerdoodles flavored with lots of festive eggnog. 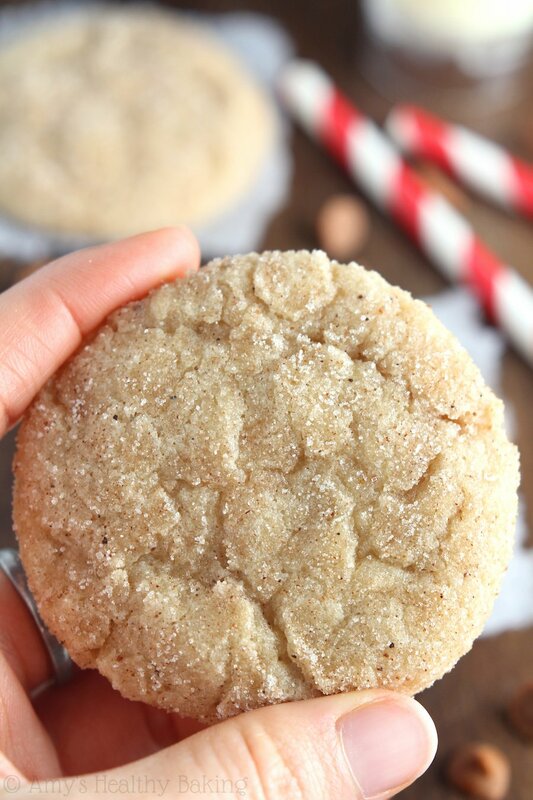 Covered in spiced sugar & positively irresistible—they’re sure to be a big hit! Every winter break, my high school marching band boarded five big charter buses and drove south for a trip. One year we participated in the Rose Parade; another two, we competed in the Fiesta Bowl marching band competition held the day before the football game. On the way home from those big events, we always stopped at Disneyland. Our band director arranged for us to march down Main Street and weave around the rides, playing holiday tunes for all of the theme park guests to enjoy. Before and after the parade, we ran around the park, standing in lines for Pirates of the Caribbean, screaming on the Matterhorn, and spinning wilding in circles on the Tea Cups. We really worked up an appetite dashing between rides to fit in as many as we possibly could, so Disneyland kindly gave us each a $10 meal voucher in exchange for the parade. Most years, we spent it on the world’s best pizza from Pizza Port (that crust… ohmygosh it’s the softest and chewiest you’ll ever eat! ), while a few kids branched out and bought turkey legs bigger than my head. One year, we craved sugar and spent our entire vouchers at the Blue Ribbon Bakery and Candy Palace on Main Street. We watched the workers slicing fudge and dipping caramel apples, then browsed through the various lollipops and chocolates. But my favorites were always the brownies and cookies from the bakery, especially the snickerdoodles. They were incredibly soft and chewy… And bigger than my entire hand. I never shared! 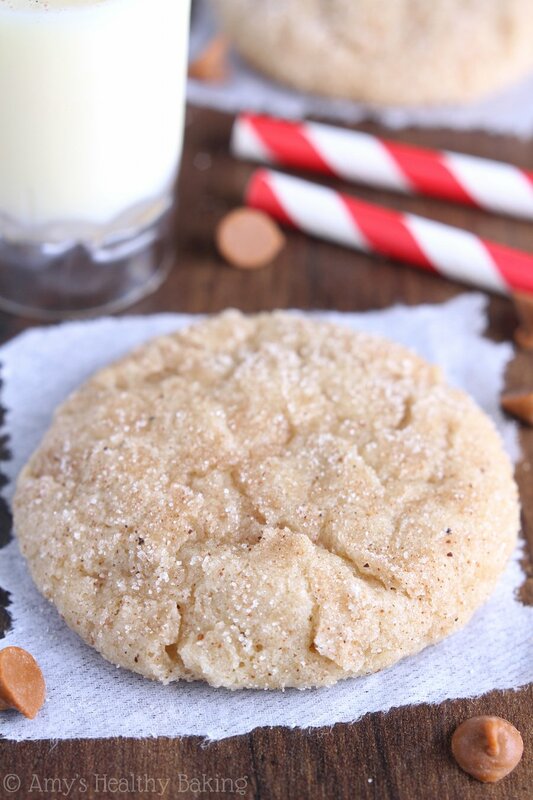 When those memories resurfaced this past week while watching a commercial for Disneyland on TV, a fierce craving for snickerdoodles hit. 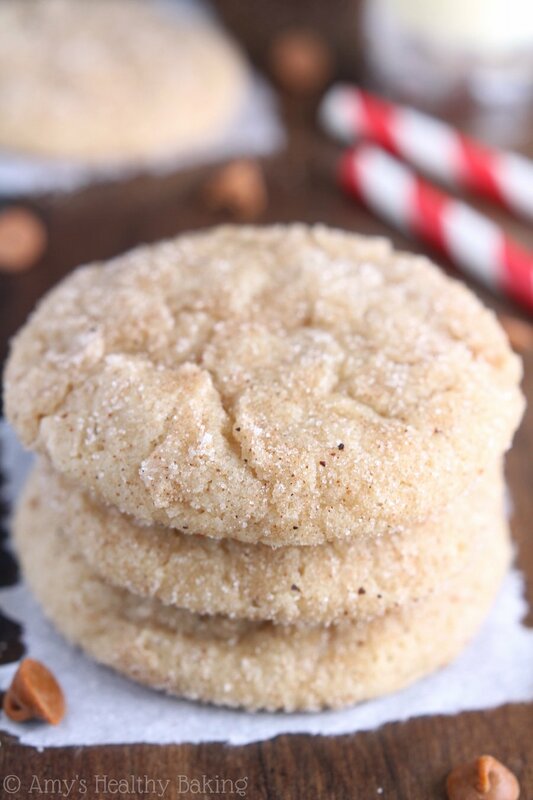 As I pulled out the butter from the fridge and spotted the eggnog carton, I decided to make my own holiday variation and created these Eggnog Snickerdoodles instead! They’re cookie #2 of Cookie Week on Amy’s Healthy Baking! We made rainbow chocolate chip cookies before—the butteriest healthy cookies you’ll ever try—and still to come are minty, spiced, and classic treats. Stay tuned! 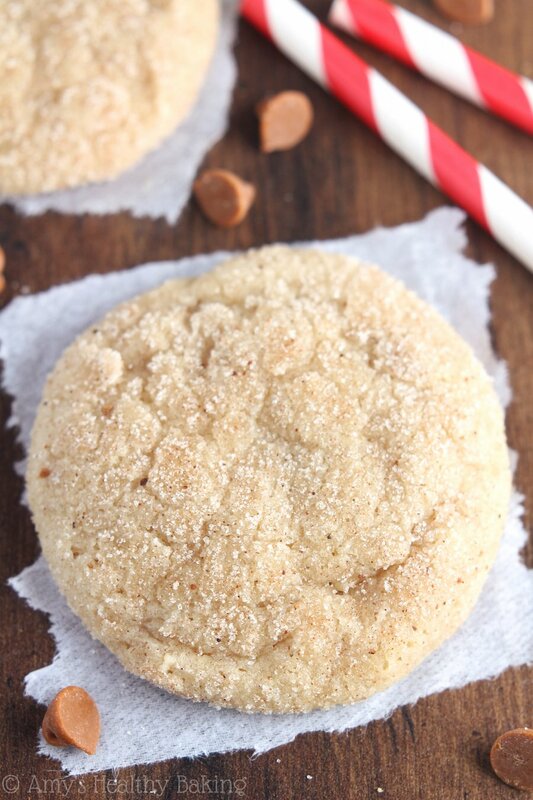 My #1 Tip for these Eggnog Snickerdoodles is to make sure you measure the flour correctly. Use one of two options: a light hand with the spoon-and-level method or a kitchen scale. I highly recommend the latter! This is the inexpensive kitchen scale that I own, and I use it to make every recipe on this blog. It’s worth its weight in gold because it ensures that your baked goods turn out with the perfect taste and texture every time! With ¼ cup of eggnog, the cookie dough is very wet, so chilling is mandatory. I’ve tried chilling for 30 minutes and for up to 2 hours. Either way, the cookie dough never fully stiffens, so rolling it is going to be a somewhat sticky affair. My best advice? Use a spoon and spatula (or a cookie scoop!) 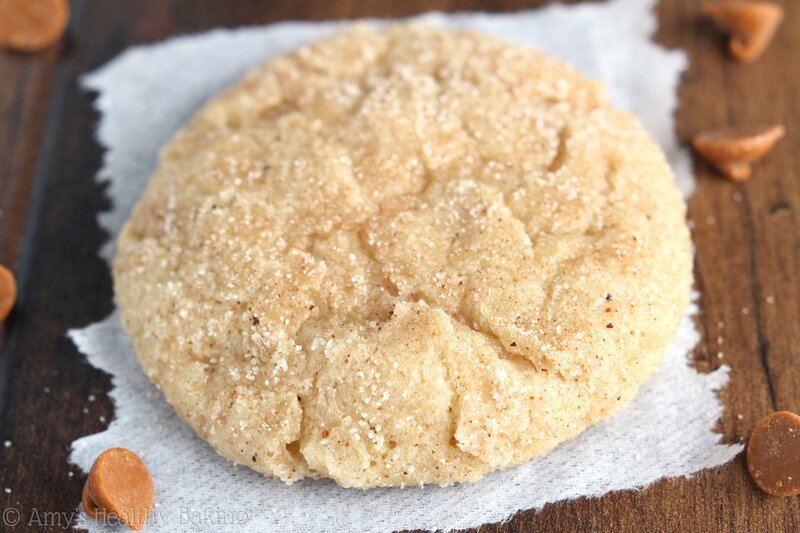 to drop a rounded mound of cookie dough directly into the spiced sugar. Turn the cookie dough around until it’s covered; then roll it between your palms to shape it into a ball. That thin layer of sugar on the outside mostly prevents it from sticking to your hands. 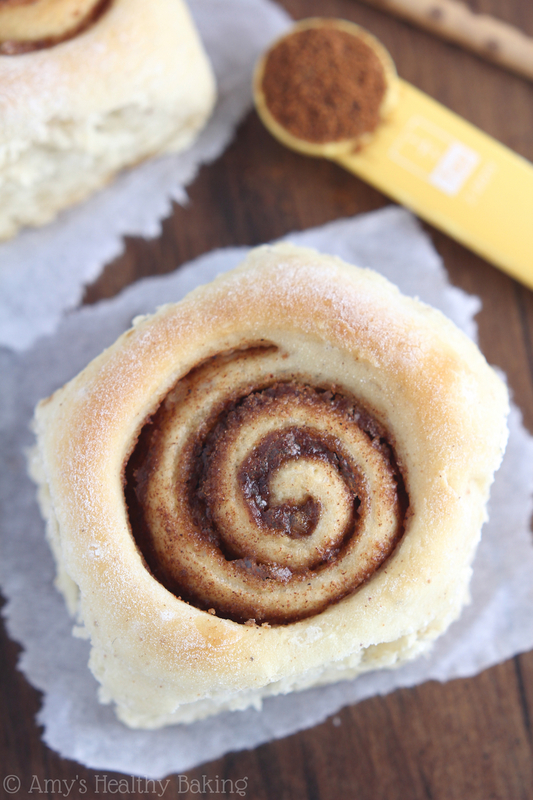 Because I just love cinnamon and nutmeg, I dropped mine back into the sugar to roll again. Seriously you guys… Do the double roll! It creates a cute glittery coating on the cookies, and it adds a tiny crunchy touch, which beautifully complements the extra chewy insides. 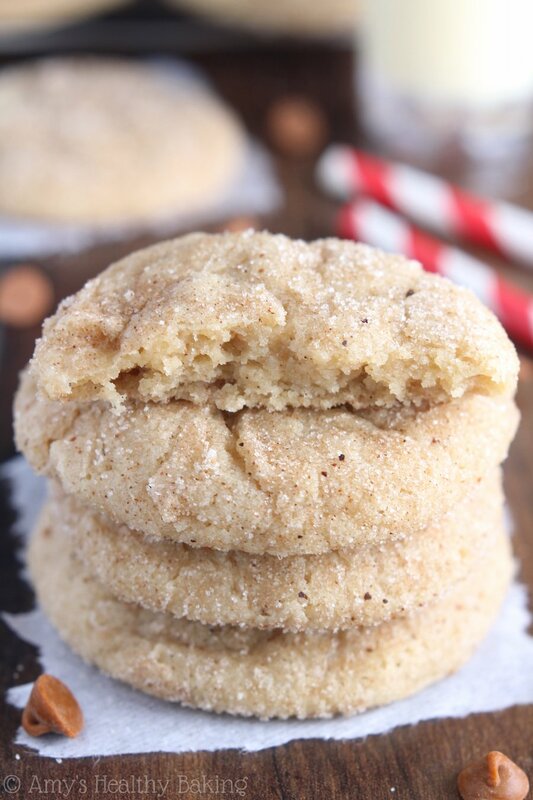 I brought two dozen of these Eggnog Snickerdoodles to my guy’s family’s Thanksgiving dinner. As soon as I set them down, one of his uncles immediately grabbed three from the plate to much on while we waited for the turkey to rest. I’m not the only one with no self-control around these… They’re that good! And when you make your own, remember to snap a picture and share it on Instagram using #amyshealthybaking and tagging @amyshealthybaking IN the photo itself! (That guarantees I’ll see your picture! ?) 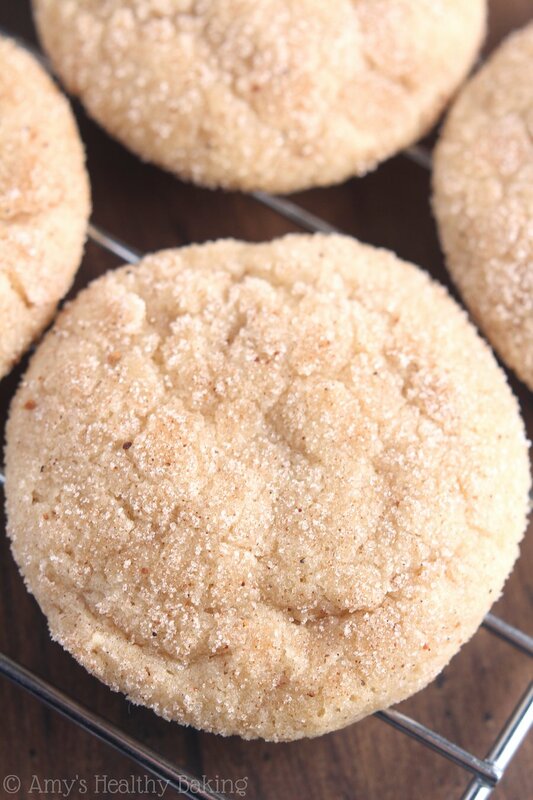 I’d love to see your snickerdoodles and feature them in my Sunday Spotlight series! The prominent eggnog flavor in these cookies is really festive for the holiday season! 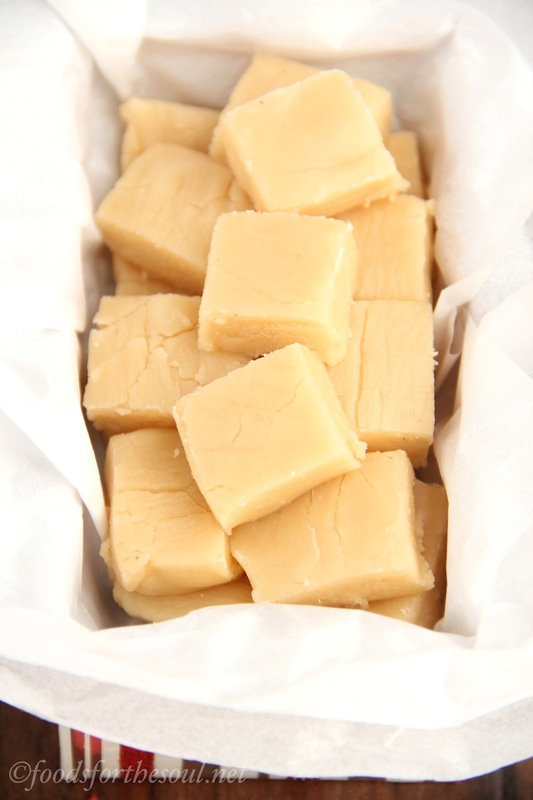 They’re incredibly soft and chewy, and they’ll stay that way for a week if stored in an airtight container—if they last that long! To prepare the coating, stir together the sugar, cinnamon, and nutmeg in a small bowl. Using a spoon and spatula or a cookie scoop, drop one portion of cookie dough into rounded mounds in the bowl of spiced sugar. Rotate it until its fully coated; then roll it between your palms into a ball. Drop it back in the spiced sugar, coat again, and place on the prepared baking sheet. If the cookie dough was chilled longer than 1 hour, flatten the cookie dough balls slightly. Bake the cookies at 350°F for 9-12 minutes. Cool on the baking sheet for 10 minutes before turning out onto a wire rack. Notes: This recipe is easily doubled! Chill the cookie dough for at least 1 hour if doubling. Make sure the eggnog is warmed to room temperature. Otherwise, it will quickly chill the melted butter and make it re-solidify. If this happens, microwave the mixture (in a microwave-safe bowl!) for 8-12 seconds, or until the butter re-melts. For a vegan version, substitute Earth Balance Buttery Spread in place of the butter, and use holiday “nog” from Silk or So Delicious. If the cookies did not spread while baking, there was too much flour in the dough. It's very important to measure the flour correctly using the spoon and level method or a kitchen scale. If the flour is scooped directly from the container using a measuring cup, you'll end up with 1.5 times as much flour in your cookie dough, which will make the cookies dry and cakey, as well as prevent the cookies from spreading. If your cookie dough seems too dry in comparison the cookie dough in the video (in the blog post above the recipe), mix in additional eggnog 1 teaspoon at a time until your cookie dough resembles the texture of the cookie dough in the video after chilling. You can skip the chilling step and bake the cookies right away. Delicious! I made 3 dozen of these for Christmas and each batch turned out amazing. I’m so glad you enjoyed these snickerdoodles Alissa! 🙂 A belated Merry Christmas to you and your loved ones!